Special Interest Groups (SIGs) are a vibrant forum for ADAA members with a common interest, such as a particular disorder, treatment, or population. SIGs encourage education, research, mentoring, and networking. SIGs meet virtually and in person at the annual conference. SIG members propose conference symposia and workshops, topics for public or professional education webinars, or web content. Program suggestions must be approved by ADAA committees (e.g. Professional Education, Conference, or Public Education). SIGs can hold free monthly online peer consultation groups to provide a safe and confidential forum for members to discuss cases, collaborate, and share resources. Please view the ADAA SIG Guidelines for responsibilities and expectations. Interested in joining a SIG? Please contact Lisa Patterson for more information. Not an ADAA member? Learn more about why you should join our professional community. 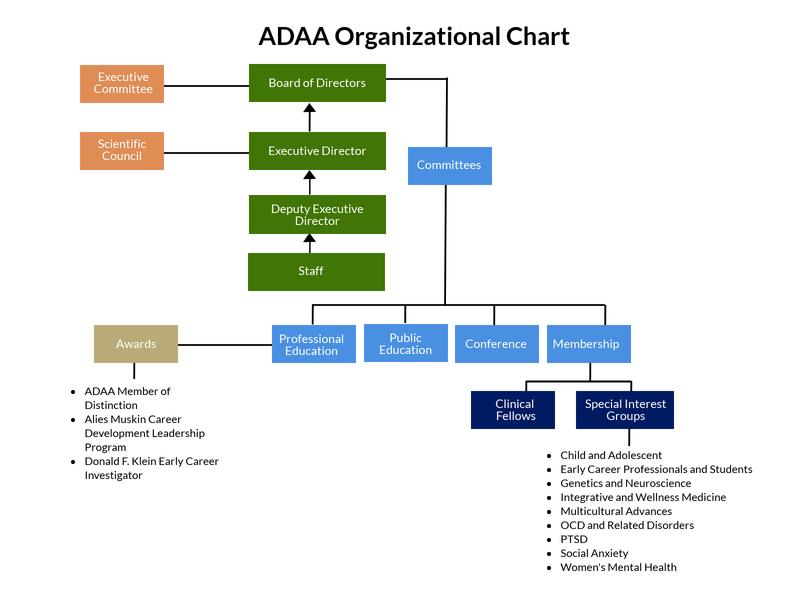 Click here to download ADAA's Organizational Chart.